Buy Sora’s adventure now to read about a true heroine who comes into her own despite the odds being stacked against her. 5.0 out of 5 starsGREAT SERIES!! This story is so COOL and engaging. The characters are awesome, real, feel like friends. The world she has built is believable and super entertaining. I'm on the third one now. keep going!!! The author went back thru and edited the series, it's perfect now! Highly recommended! 5.0 out of 5 starsA book you can sink your teeth into from the very beginning. I got this book free from Amazon.com, I'm glad I did!! OMG! this book, this book. This is the first of the Clutch Mistress Series by Janelle Peel. The moment I started this book, I could not stop reading. And honestly I'm very sad at the moment that it's over and I have to wait until payday to get the next or even the rest of what's currently out in the series. It's been a long time since a book caught my fancy so quickly and so deeply. I'm just in awe. The story is completely amazing! The writing flawless, I also like the way the POV's were setup. The characters amazingly done, very detailed, and nothing was rushed. Everything flowed so smoothly that it made the story just so vivid in my imagination. Sora her character being the lead female character, the author didn't make her mild or meek...mostly. She is fierce she is loud and proud. And the author didn't make her be the type of character I usually will roll my eyes on a few times. She is well balanced. Blaze the author didn't make him too macho, but macho enough to get that rawr factor going. However, currently my faves are Viv & Jackson, their dynamic is highly entertaining, and I can't wait to read more about them. Viv, is so sarcastic and saucy and Jackson is so um almost serious it's going to be super entertaining to read more about them. But if you are looking for a new series to sink your teeth or claws into, then this book is a must!!! I received this book as a gift to read and I am going to give a very honest opinion of what I read. This is am amazing story. I loved the characters, I loved the plot and how everything came together. Even though the story finishes with a happy for now it makes you eager to find out more about the clutch and what is going to happen. I am on of those people that will not buy are even read a free offer if it has a cliffhanger; those stories just frustrate me. This is not one of those stories. This is filled with romance, action, funny lines, sadness, but not tissue type of sadness. It has so much filled into such a small package. I definetly recommend reading this one! The story starts out with Sora feelings sorry for herself after a day working at the dinner. She was born to two of the most powerful Mages in the Seattle coven. When everyone else came into their power at puberty she did not. Still not receiving her powers by twenty one the Council decided to cast her out; banishment. She was such an embarrassment to her parents they didn’t even say goodbye to her. Selected people drove her into the center of the city and left her there with just the closes on her back. Taking one meager job after another she finally made her way to southern California and settled in San Diego. There she met Giselle; she had lost her husband and daughter in an auto accident a few years back and took Sora under her wing. Sora moved into the apartment over her garage and had dinner with her a few nights a week. As I said she is feeling sorry for herself and decides to go to the bar Curley’s and have a few drinks. She only noticed one other patron there off to the far corner of the bar. She finally left at 1:45am heading home when suddenly she knocked to the grown hitting her head on the concrete blacking out. When she comes to; guy were searching her work apron and took her wallet before they ran off. Making it back home she showered to get the dirty and blood out of her hair and went to bed. The next few days are very strange for her. People are staring at her everywhere she goes. Then one evening she gets someone knocking on the door and grabbing her baseball bat she waited at the door. She could hear them talking about a scent. Finally she sees her deadbolt unlock and the door opens. Standing there are two huge guys their names Vance and Jake. She demands to know what the want and they seem to be in a trance answering all of her questions. Telling her that Blaze had sent them out to look for her and to find out what she was. Blaze was the Leader of the So Cal clutch of vampires. The next night Blaze shows up they talk he leaves her his card telling her if she needs any advice to give him a call. After he left she tried and succeeded in putting a ward over her door and door frame to keep people out unless she invites them in. The next night it gets its first test and though it worked well the recipient was far from please. Mel the werewolf Alpha walked away in his wolf form snarling and with hair missing on his leg. She called Blaze and asked him about what happen suddenly he was at her door telling her to pack she had to get out of there. Before leaving she placed a ward over all of Giselle’s property so nothing would happen to her then she passed out. Once Blaze got her to his Clutch he has a lot of explaining to do, hopefully Sora would take it well he could only hope. Oh so much happens in this story and I can’t tell you all that I know then it would take all of the pleasure out of it for you. I will say that Blaze has an older brother that is his second in command. They are both coming close to their 1000 years of age and after that if the don’t find their mates they will fall into a madness. Now will they find their mates? Will there be a war between the werewolf’s? What about the Counsel; what are they going to do when and if they hear about Sora? There it is, now you will have to get the book if you really want to know more of it someone spills more beans than I did. I was in a bit of a slump with reading. The last few books hadn't really grabbed my attention. But this book definitely changed that. I was hooked from the beginning and I am so glad to see there are more in the series because I'm sure the rest will be good as this one if not better 😊 Sora's world changes due to a bite which awakens her vampire and mage side. She must leave everything and everyone behind. In doing so she unknowingly leaves her friend vulnerable to danger, which has some serious consequences. As a young vampire tries to make her way in the world, chaos ensues. Janelle Peel’s Vampire Mage has plenty of twists in store but it was Sora that took center stage for me. She’s gritty and tough, but also down to earth and likeable, very important properties for our main character and narrator. 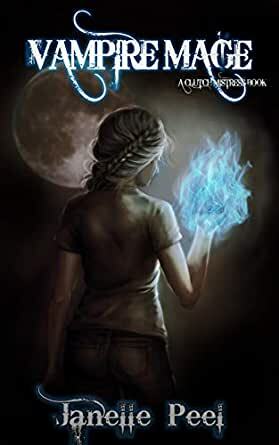 A great action-packed and heartfelt novel for any fans of Supernatural out there!